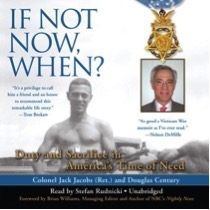 I had the honor and pleasure of being introduced to Colonel Jack Jacobs by a mutual friend at a book signing event in NYC when his book “If Not Now, When?” was released by his publisher. I was excited and intrigued with having the opportunity of meeting a Congressional Medal of Honor recipient, and was inspired along with all those in the room who were deeply and emotionally touched as he modestly told his heroic story and emphasized the vital importance and value of Duty and Sacrifice and the freedoms we enjoy that were won and are defended by those who have served in the United States Armed Forces. Below, in honor of Veteran’s Day, Colonel Jack Jacobs and all the men and women who have served in our Nation’s Military, is Jack’s story. On March 9, 1968, Jacobs was with the lead companies of his South Vietnamese battalion as they searched for the Vietcong. Suddenly, a large enemy force, hidden in bunkers only fifty yards away, opened fire with mortars, rifles, and machine guns. With no place to hide, many South Vietnamese soldiers were killed or wounded in the first few seconds. He assumed control of the unit, ordering a withdrawal from the exposed position to a defensive perimeter. He dragged a wounded American sergeant, riddled with chest and stomach wounds, to safety, then returned to the fire-swept battlefield to rescue others. Each time he returned, he had to drive off the Vietcong, and single-handedly killed three and wounded many others. Despite being weak from blood loss, he went back time and again, bringing to safety thirteen fellow soldiers before he tried to take a brief rest—and discovered he couldn’t get up again. During the helicopter ride to the field hospital, he lost consciousness several times. Days later at another hospital, doctors pieced his skull and face together. Though he would undergo more than a dozen surgical operations, he never regained his senses of taste and smell. Back in the United States, Jacobs was assigned to Fort Benning, where he became the commander of an Officer Candidate company. About a year after the action, he received an order to report to Washington, and on October 9, 1969, at a ceremony at the White House, he was awarded the Medal of Honor. After retiring from the Military, Jack Jacobs went on to utilize the skills and strategies he learned in the Military to build a successful career in the financial industry. Jack states “the nine principles of war, as taught in the military, have great applicability in civilian life, and that chief among them is that there must be a clear objective before doing something. First of all, I was using all the techniques I learned as a young soldier in business, and they proved to be the perfect ones focusing on the objectives, making use of scarce resources, making sure the people who worked for me were trained. All the stuff we do in the military turned out to be great tools on Wall Street. It gave me pleasure to realize that while life is difficult, it’s not all that complicated. So I felt comfortable. So it’s important to have people with diverging views around you, people whose views you respect, whose intellect you respect, and who may even be perceived by you to be a threat to you but you’ve got to have them around you anyway. Surround yourself with people who are better than you are, and you’ll do a lot better." Jack’s wisdom and his statement “If Not Now, When? If Not You, Who?” should ring loud and clear to business owners and leaders who want to grow their business and have thought about but have not harnessed the full potential of their companies, by surrounding themselves with a diverse team of strategic, innovative thinkers who can see through the fog and stress of day to day operations, provide a wide network of resources and create an effective strategic plan and road map to win the battles and accomplish their objectives. Regardless of stage, the earlier a business forms a board the better its chances for rapid growth and success. The early infusion of focus on strategic planning can reap huge rewards in both war and business! Today, Jack Jacobs is widely regarded as one of the world’s most knowledgeable and outspoken military analysts. His career has bridged the disparate worlds of the military, business and academia. You can read an excerpt from his book and learn more in NBC News’ coverage of the book.